How is the Torrance Test Scored? What is the Torrance Test? The TTCT (Torrance Tests of Creative Thinking) assess how creatively a child’s mind works and are often given to children in order to determine advanced placement or as part of an entrance examination. They are very different from the intelligence and reasoning tests your child may already have taken. Instead of traditionally taught subjects such as reading or math, these tests assess creativity. Children are scored on a number of aspects, including creative titles for pictures, expressions, imagery and humor. Therefore, your child hasn’t “learned” the content that will be tested on the Torrance, since it involves more ambiguous concepts than the ones that are driven home in the classroom. As the name suggests, the Torrance Tests of Creative Thinking test, in large part, how creative and imaginative your child is. The Torrance Tests of Creative Thinking (TTCT) is designed to identify and evaluate creative potential using two parts – a Verbal test and a Figural test. The Verbal test contains seven subtests – Asking, Guessing Causes, Guessing Consequences, Product Improvement, Unusual Uses, Unusual Questions, and Just Suppose. Subtests are scored on the basis of fluency, flexibility, and originality (with a score on elaboration as optional), and these scores are accumulated across all subtests. The totals may be converted to standard T scores if normative reference is desired. The Figural test has three subsets – Picture Construction (from a marked cue), Picture Completion (again with cues), and Parallel Lines. The first of these subtests is scored on originality and elaboration while the remainder are scored on fluency, flexibility, originality, and elaboration. Totals are then accumulated across subtests to provide overall scores for Figural fluency, flexibility, originality, and elaboration. These scores, as in the Verbal test, can be converted to a standard T score. The tests are game-like to catch children’s interests. The scoring of the tests is by hand and require careful attention to the manual for reliable results. However, “streamlined” guides are available and are helpful in developing greater familiarity with the test and its scoring procedures. Grades K through graduate school. Many school districts include some kind of creativity testing as part of their assessment of gifted children. One of the most common tests used to assess creativity in a child or an adult is the Torrance Tests of Creative Thinking. The TTCT test is a series of figural exercises (thinking with pictures) and verbal activities (thinking with words) that students do to showcase their creative abilities. The full test is a series of individual exercises that are administered by a psychologist over a 90-minute period. While it isn’t the perfect creativity test, it has proved to be highly reliable over the years as a predictor of successful, creative individuals of all ages. This test is used by both businesses and schools. Often, in a school setting, a few of the exercises from the TTCT test are chosen to be administered along with other intelligence or achievement tests. They might choose one figural and one verbal activity to include in their evaluation if they are looking for children who are both highly creative and intelligent to be part of their program. To get started with all of the Torrance testing material offered by Testing Mom, check out our 100 Free Questions. The Torrance Tests of Creative Thinking can also be given to adults. There are two versions, Figural and Verbal. While the Figural test is approved for kindergarten students, the verbal test begins at first grade. By assessing creative thought, these tests often provide useful insight for administrators regarding student placement. Children who produce rather boring or common results are scored lower. The more detail, imagination and fantasy are incorporated into an answer, the higher the results. Studies have shown that highly imaginative and creative children are often (not always) some of the very brightest. While it’s harder to prepare for creative tests than it is for tests that measure aptitude and knowledge, there are a number of ways to get your child thinking more creatively. One way is to ask him to tell you a story every day, or have her talk about the funniest (or strangest or creepiest or most interesting) thing that happened to them that day! More details can be found at http://en.wikipedia.org/wiki/Torrance_Tests_of_Creative_Thinking. I want free tact test for my daughter. Can I purchase torrance testing of creative thinking from your website. I will to test my daughter’s cretaivity score. You can contact us at help@testingmom.com or call us at 877-609-6203 and a Parent Success Team member will help you sign up! How are you? I hope that you are well. could I get a PDF original ttct. I am a Master student working on creative thinking. What is the main difference between the Torrance Tests of Creative Thinking Figural streamlined and the Renzulli creativity test? My child scored a 98% on the Renzulli test and a 50+ percentile on TCTT. Seems too much of a difference. 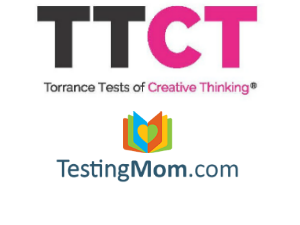 Torrance® Tests of Creative Thinking (TTCT), Eighth Edition is a registered trademark of Scholastic Testing Services, Inc. or its affiliate(s), or their licensors. TestingMom.com is not affiliated with nor related to Scholastic Testing Services, Inc. or its affiliates (“Scholastic”). Scholastic does not sponsor or endorse any TestingMom.com product, nor have TestingMom.com products or services been reviewed, certified, or approved by Scholastic. Trademarks referring to specific test providers are used by TestingMom.com for nominative purposes only and such trademarks are solely the property of their respective owners.